Download "Alabama Statewide. Arkansas Statewide"
1 Alabama Statewide Alabama generally follows the guidelines of the or ICC, which in turn recognizes the American Society of Sanitary Engineering (ASSE) 1055 requirements, and consequently Alabama s IPC standard, our equipment is acceptable from a plumbing regulatory standpoint anywhere the IPC is adopted. In most applications, our E- gap backflow prevention device will be accepted in Alabama. 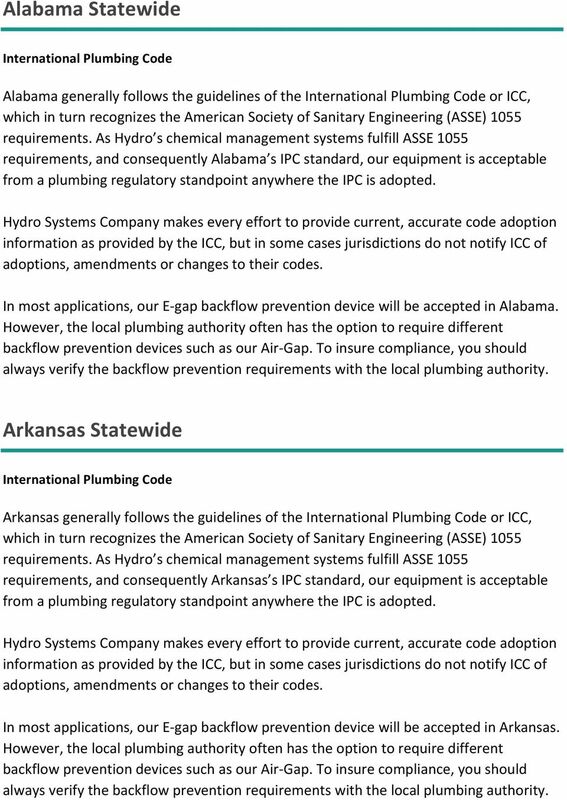 Arkansas Statewide Arkansas generally follows the guidelines of the or ICC, which in turn recognizes the American Society of Sanitary Engineering (ASSE) 1055 requirements, and consequently Arkansas s IPC standard, our equipment is acceptable from a plumbing regulatory standpoint anywhere the IPC is adopted. In most applications, our E- gap backflow prevention device will be accepted in Arkansas. 3 should always verify the backflow prevention requirements with the local plumbing Florida Statewide Florida generally follows the guidelines of the or ICC, which in turn recognizes the American Society of Sanitary Engineering (ASSE) 1055 requirements, and consequently Florida s IPC standard, our equipment is acceptable from a plumbing regulatory standpoint anywhere the IPC is adopted. In most applications, our E- gap backflow prevention device will be accepted in Florida. Georgia Statewide Georgia generally follows the guidelines of the or ICC, which in turn recognizes the American Society of Sanitary Engineering (ASSE) 1055 requirements, and consequently Georgia s IPC standard, our equipment is acceptable from a plumbing regulatory standpoint anywhere the IPC is adopted. 4 In most applications, our E- gap backflow prevention device will be accepted in Georgia. 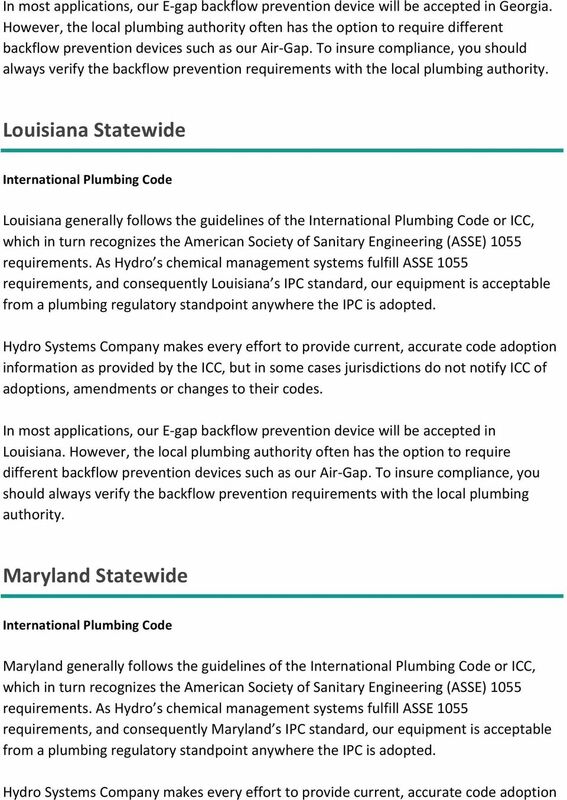 Louisiana Statewide Louisiana generally follows the guidelines of the or ICC, which in turn recognizes the American Society of Sanitary Engineering (ASSE) 1055 requirements, and consequently Louisiana s IPC standard, our equipment is acceptable from a plumbing regulatory standpoint anywhere the IPC is adopted. In most applications, our E- gap backflow prevention device will be accepted in Louisiana. However, the local plumbing authority often has the option to require should always verify the backflow prevention requirements with the local plumbing Maryland Statewide Maryland generally follows the guidelines of the or ICC, which in turn recognizes the American Society of Sanitary Engineering (ASSE) 1055 requirements, and consequently Maryland s IPC standard, our equipment is acceptable from a plumbing regulatory standpoint anywhere the IPC is adopted. 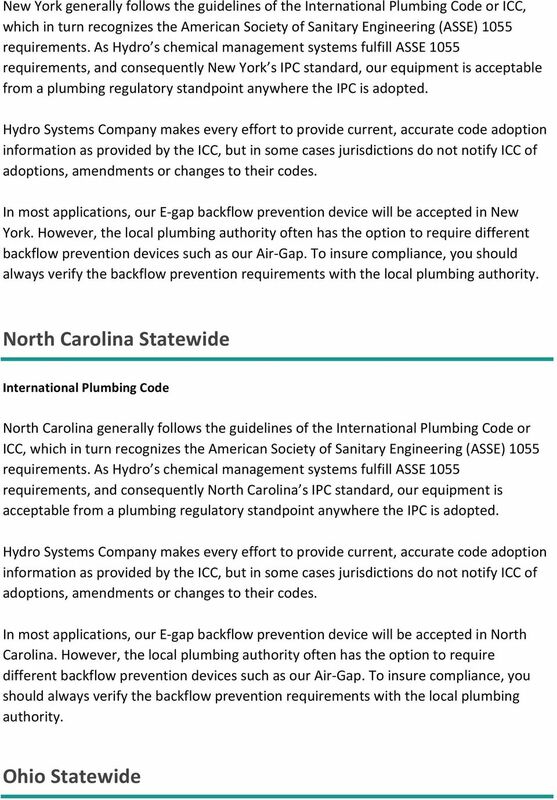 8 Ohio generally follows the guidelines of the or ICC, which in turn recognizes the American Society of Sanitary Engineering (ASSE) 1055 requirements, and consequently Ohio s IPC standard, our equipment is acceptable from a plumbing regulatory standpoint anywhere the IPC is adopted. In most applications, our E- gap backflow prevention device will be accepted in Ohio. 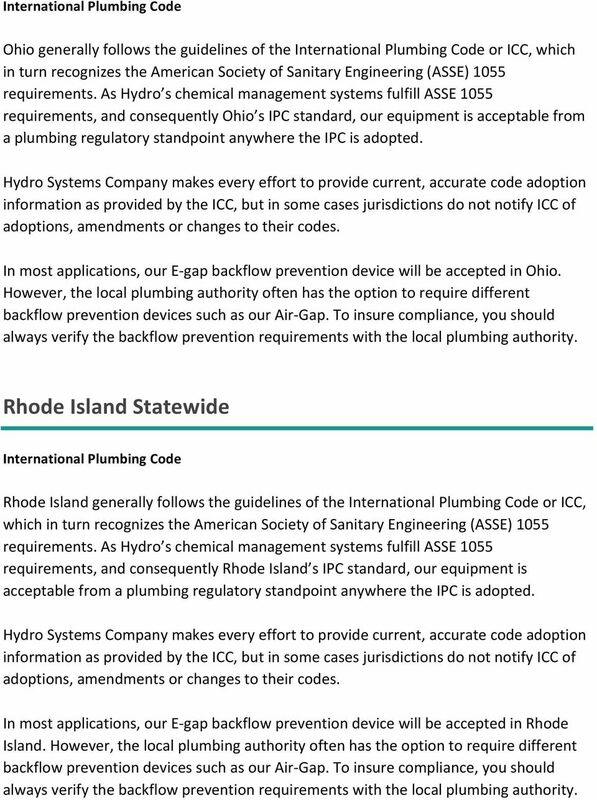 Rhode Island Statewide Rhode Island generally follows the guidelines of the or ICC, which in turn recognizes the American Society of Sanitary Engineering (ASSE) 1055 requirements, and consequently Rhode Island s IPC standard, our equipment is acceptable from a plumbing regulatory standpoint anywhere the IPC is adopted. In most applications, our E- gap backflow prevention device will be accepted in Rhode Island. 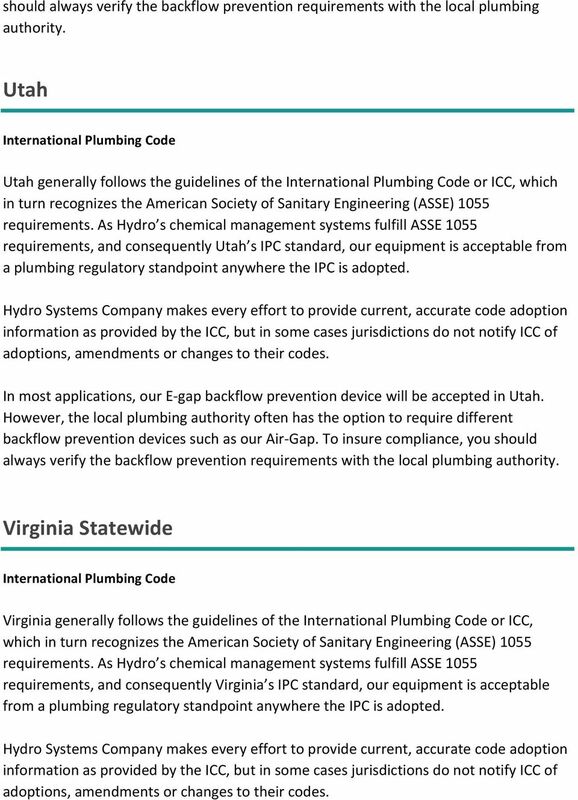 10 should always verify the backflow prevention requirements with the local plumbing Utah Utah generally follows the guidelines of the or ICC, which in turn recognizes the American Society of Sanitary Engineering (ASSE) 1055 requirements, and consequently Utah s IPC standard, our equipment is acceptable from a plumbing regulatory standpoint anywhere the IPC is adopted. In most applications, our E- gap backflow prevention device will be accepted in Utah. Virginia Statewide Virginia generally follows the guidelines of the or ICC, which in turn recognizes the American Society of Sanitary Engineering (ASSE) 1055 requirements, and consequently Virginia s IPC standard, our equipment is acceptable from a plumbing regulatory standpoint anywhere the IPC is adopted. 11 In most applications, our E- gap backflow prevention device will be accepted in Virginia. California Statewide Uniform Plumbing Code California generally follows the guidelines of the Uniform Plumbing Code or UPC which in turn recognizes the American Society of Sanitary Engineering (ASSE) 1055 requirements, and consequently California s UPC standard, our equipment is acceptable from a plumbing regulatory standpoint anywhere the UPC is adopted. In most applications, our E- gap backflow prevention device will be accepted in California. However, the local plumbing authority often has the option to require should always verify the backflow prevention requirements with the local plumbing Hawaii Statewide Uniform Plumbing Code Hawaii generally follows the guidelines of the Uniform Plumbing Code or UPC which in turn recognizes the American Society of Sanitary Engineering (ASSE) 1055 requirements. 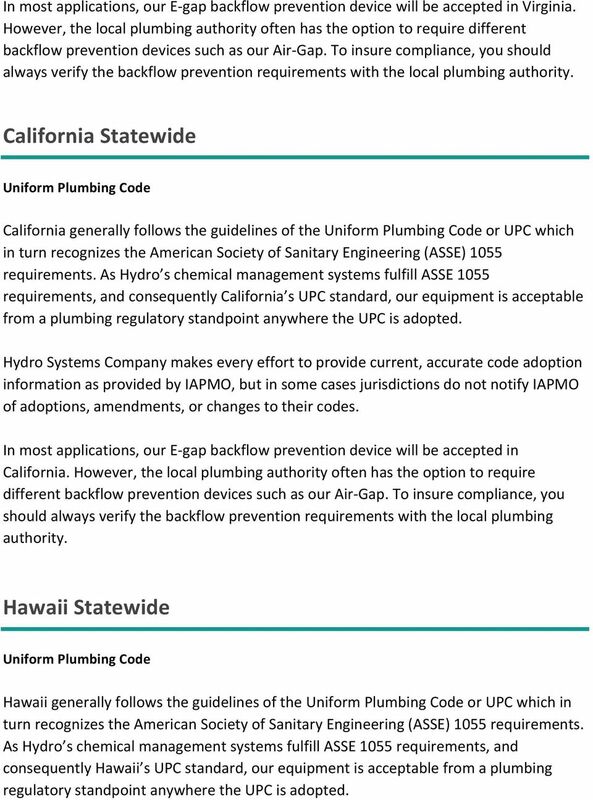 As Hydro s chemical management systems fulfill ASSE 1055 requirements, and consequently Hawaii s UPC standard, our equipment is acceptable from a plumbing regulatory standpoint anywhere the UPC is adopted. 12 In most applications, our E- gap backflow prevention device will be accepted in Hawaii. 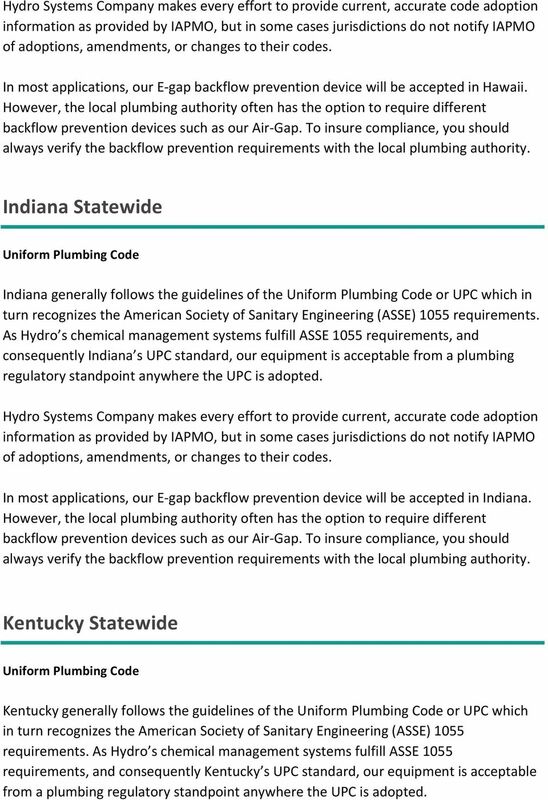 Indiana Statewide Uniform Plumbing Code Indiana generally follows the guidelines of the Uniform Plumbing Code or UPC which in turn recognizes the American Society of Sanitary Engineering (ASSE) 1055 requirements. 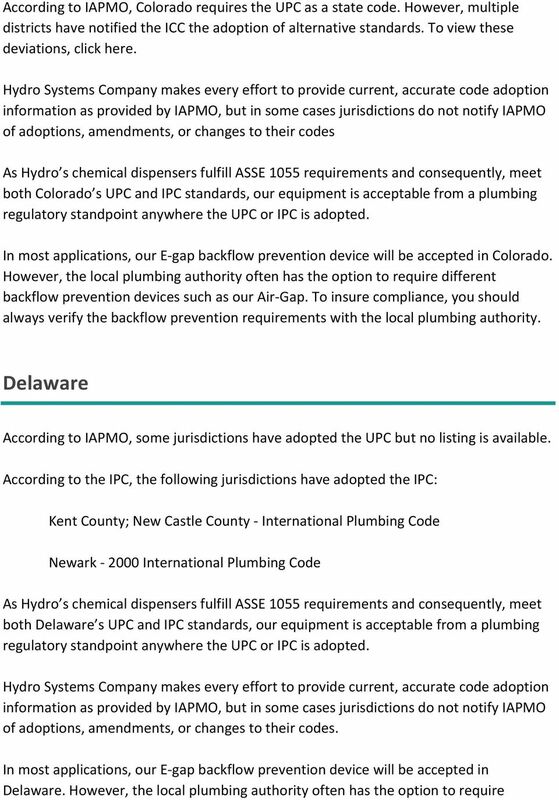 As Hydro s chemical management systems fulfill ASSE 1055 requirements, and consequently Indiana s UPC standard, our equipment is acceptable from a plumbing regulatory standpoint anywhere the UPC is adopted. In most applications, our E- gap backflow prevention device will be accepted in Indiana. Kentucky Statewide Uniform Plumbing Code Kentucky generally follows the guidelines of the Uniform Plumbing Code or UPC which in turn recognizes the American Society of Sanitary Engineering (ASSE) 1055 requirements, and consequently Kentucky s UPC standard, our equipment is acceptable from a plumbing regulatory standpoint anywhere the UPC is adopted. 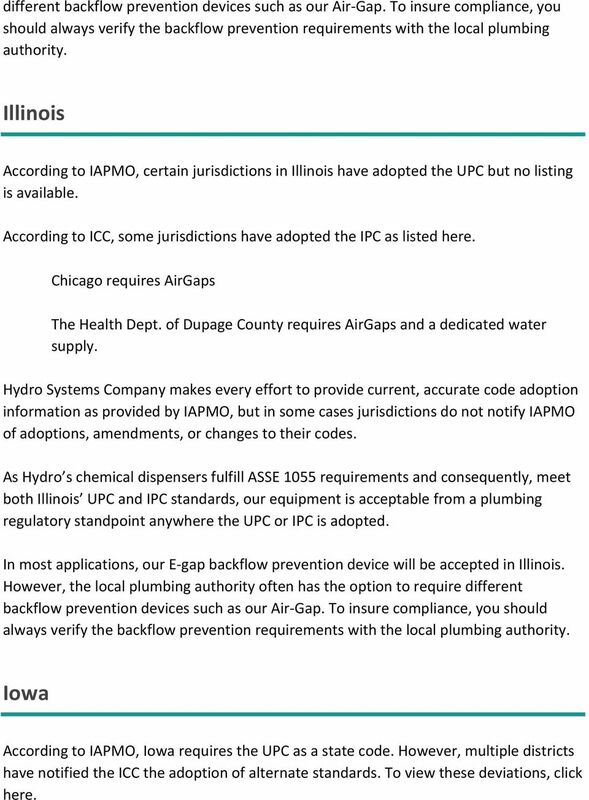 19 should always verify the backflow prevention requirements with the local plumbing Illinois According to IAPMO, certain jurisdictions in Illinois have adopted the UPC but no listing is available. According to ICC, some jurisdictions have adopted the IPC as listed here. Chicago requires AirGaps The Health Dept. of Dupage County requires AirGaps and a dedicated water supply. both Illinois UPC and IPC standards, our equipment is acceptable from a plumbing regulatory standpoint anywhere the UPC or IPC is adopted. In most applications, our E- gap backflow prevention device will be accepted in Illinois. 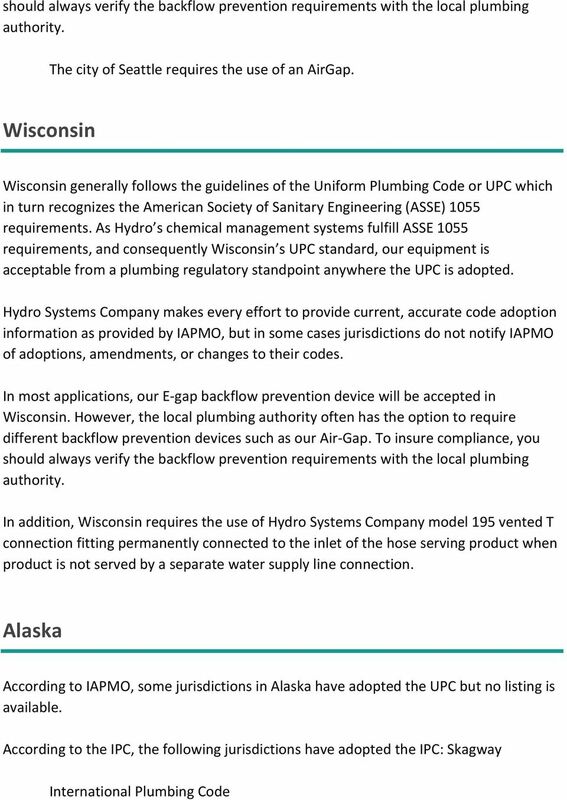 Iowa According to IAPMO, Iowa requires the UPC as a state code. However, multiple districts have notified the ICC the adoption of alternate standards. To view these deviations, click here. 22 Minnesota Currently, neither IAPMO nor ICC list regulatory information for Minnesota. Regulations may vary district by district. To insure compliance, you should always verify the backflow prevention requirements with the local plumbing Additionally, Minnesota requires a preventable backflow device on faucets. Click on the link below for detailed information and diagram: Minnesota form CDO Missouri According to IAPMO, certain jurisdictions in Missouri have adopted the UPC but no listing is available. According to ICC, some jurisdictions have adopted the IPC as listed here. 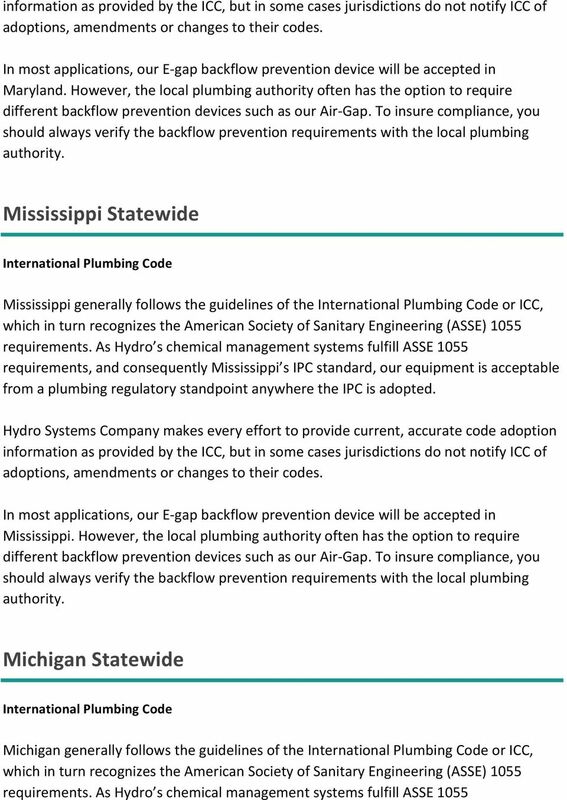 information as provided by IAPMO and ICC, but in some cases jurisdictions do not notify IAPMO and/or the ICC both Missouri s UPC and IPC standards, our equipment is acceptable from a plumbing regulatory standpoint anywhere the UPC or IPC is adopted. In most applications, our E- gap backflow prevention device will be accepted in Iowa. Nebraska According to IAPMO, certain jurisdictions in Nebraska have adopted the UPC but no listing is available. 23 According to the UPC, some jurisdictions have adopted the IPC as available here. 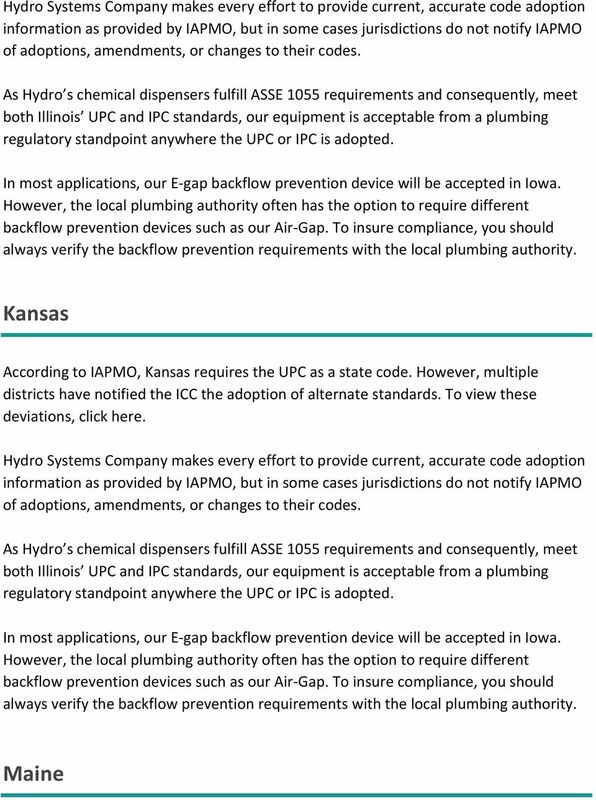 information as provided by IAPMO and ICC, but in some cases jurisdictions do not notify IAPMO and/or the ICC both Nebraska s UPC and IPC standards, our equipment is acceptable from a plumbing regulatory standpoint anywhere the UPC or IPC is adopted. In most applications, our E- gap backflow prevention device will be accepted in Nebraska. However, the local plumbing authority often has the option to require should always verify the backflow prevention requirements with the local plumbing Omaha requires AirGaps. Nevada According to IAPMO, certain jurisdictions in Nevada have adopted the UPC but no listing is available. 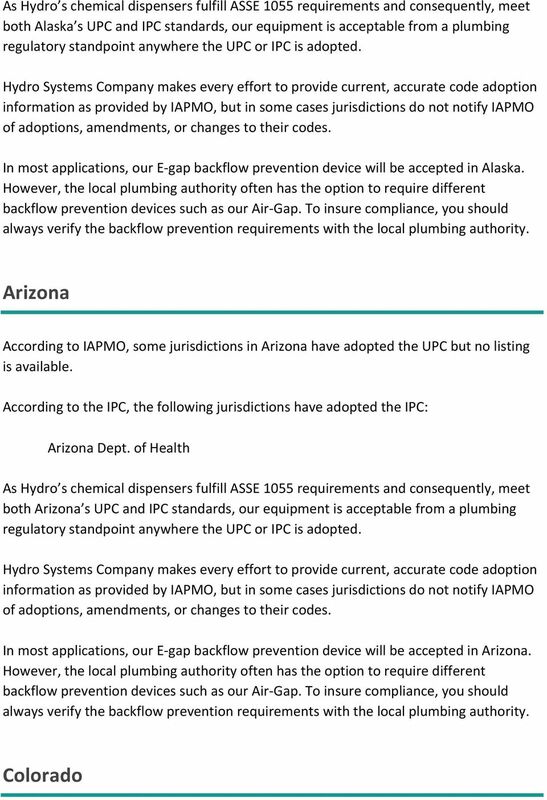 According to the IPC, the following jurisdictions have adopted the IPC: Fernley; North Lyon County FPD - information as provided by IAPMO and ICC, but in some cases jurisdictions do not notify IAPMO and/or the ICC both Nevada s UPC and IPC standards, our equipment is acceptable from a plumbing regulatory standpoint anywhere the UPC or IPC is adopted. In most applications, our E- gap backflow prevention device will be accepted in Iowa. 26 South Dakota According to IAPMO, some jurisdictions have adopted the UPC but no listing is available. According to the IPC, the following jurisdictions have adopted the IPC. 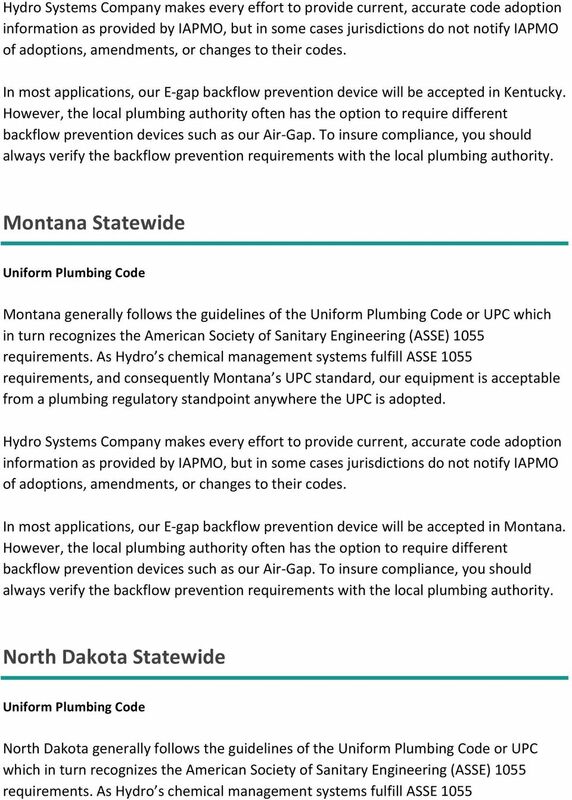 Hot Springs information as provided by IAPMO and ICC, but in some cases jurisdictions do not notify IAPMO and/or the ICC both South Dakota s UPC and IPC standards, our equipment is acceptable from a plumbing regulatory standpoint anywhere the UPC or IPC is adopted. In most applications, our E- gap backflow prevention device will be accepted in South Dakota. Texas According to ICC, Texas has adopted the IPC as a state code. However, certain districts have notified IAPMO of the adoption of UPC standards but no listing is available. information as provided by IAPMO and ICC, but in some cases jurisdictions do not notify IAPMO and/or the ICC both Texas UPC and IPC standards, our equipment is acceptable from a plumbing regulatory standpoint anywhere the UPC or IPC is adopted. 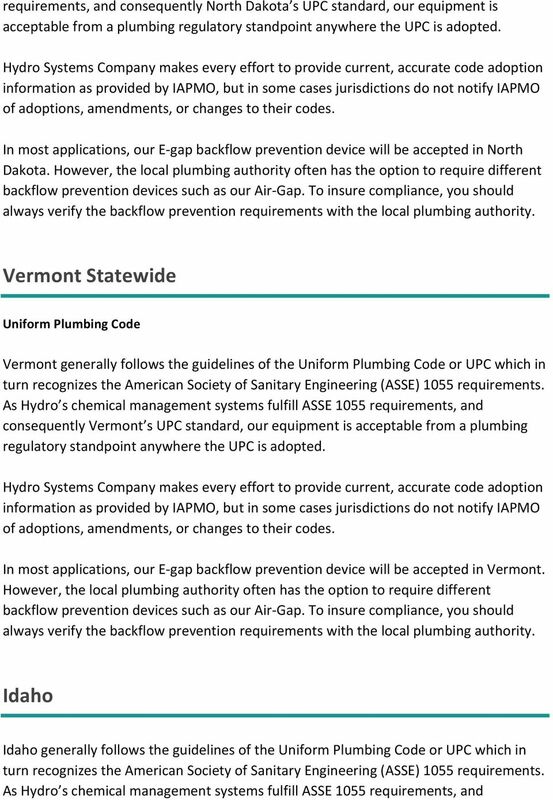 28 information as provided by IAPMO and ICC, but in some cases jurisdictions do not notify IAPMO and/or the ICC both Wyoming s UPC and IPC standards, our equipment is acceptable from a plumbing regulatory standpoint anywhere the UPC or IPC is adopted. In most applications, our E- gap backflow prevention device will be accepted in Wyoming. 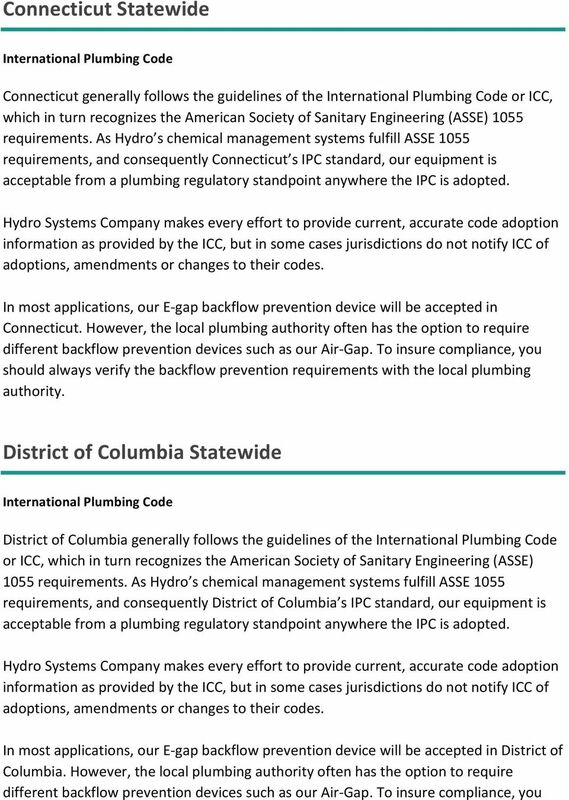 However, the local plumbing authority often has the option to require should always verify the backflow prevention requirements with the local plumbing As Hydro's chemical dispensers fulfill ASSE 1055 requirements and consequently, meet IPC standards, our equipment is acceptable from a plumbing regulatory standpoint anywhere the IPC is adopted. International Code Council (ICC). The 2003 Code states: 2003 / Chapter 6 Water Supply and Distributions / Section 608 Protection of Potable Water Supply / Backflow Protection / Chemical Dispenser Backflow Devices Chemical Dispenser Backflow Devices Backflow devices for chemical dispensers shall comply with ASSE1055 or shall be equipped with an air gap fitting. 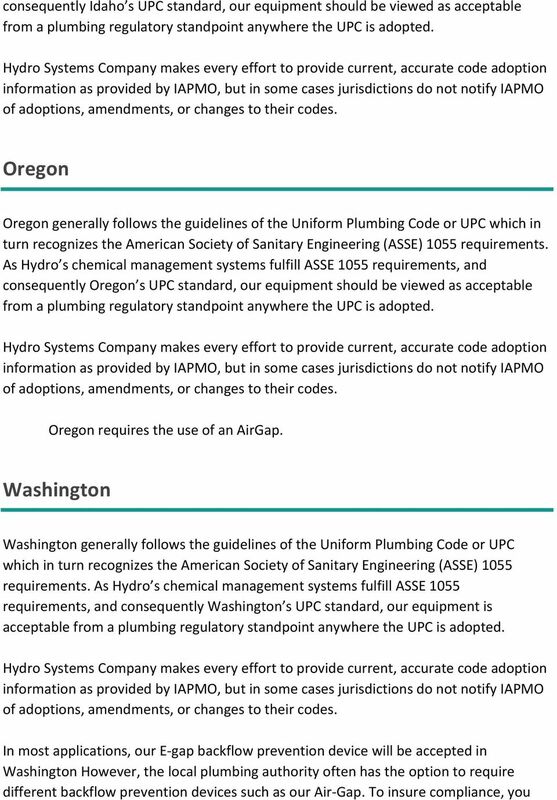 Uniform Plumbing Code The Uniform Plumbing Code (UPC) is written by the International Association of Plumbing and Mechanical Officials (IAPMO). 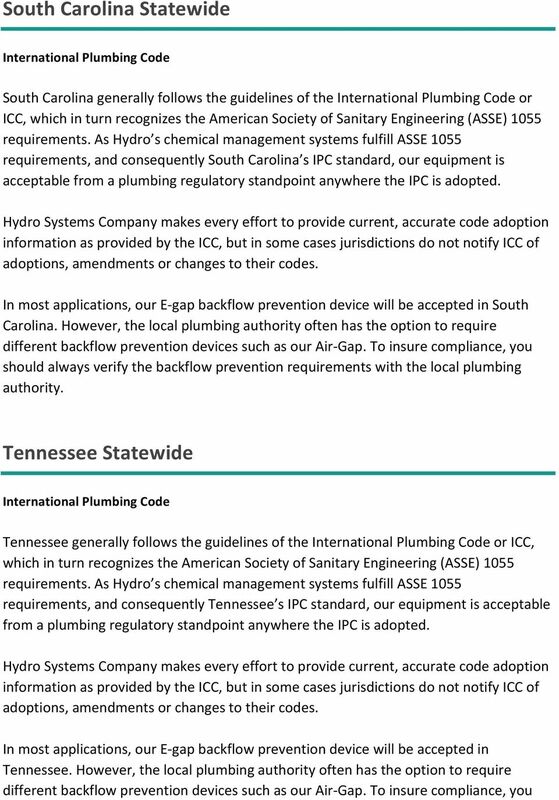 30 Hydro Systems' AirGap eductors and E- gap eductors used in chemical dispensers are listed to CSA standard B This standard requires Hydro dispensers with built- in backflow preventers have the backflow preventers tested to CSA standard B- 64. B64-94 Backflow Preventers and Vacuum Breakers The B64-94 standard defines requirements for stand- alone backflow preventers and vacuum breakers. 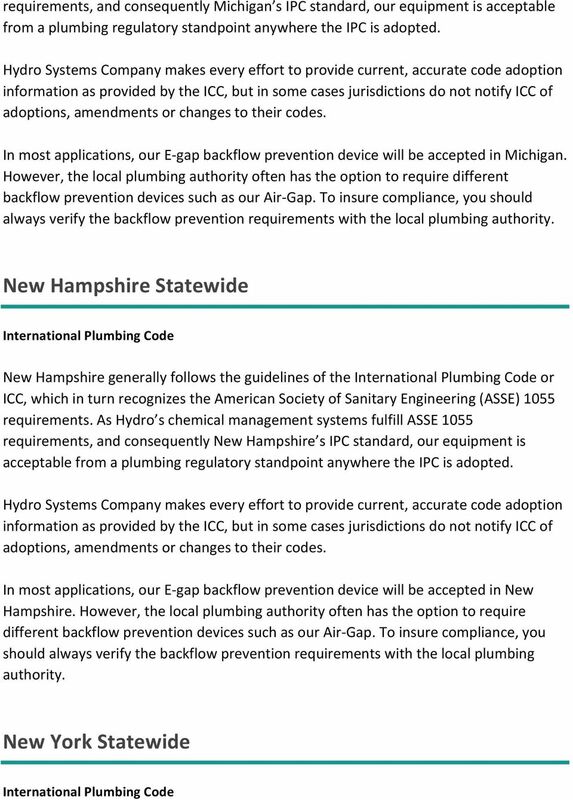 Hydro's E- gap eductor and AirGap eductors are not for sale as a stand- alone backflow preventer and therefore, are not listed to this standard. Hydro's eductors are acceptable backflow preventers when used in chemical dispensers, and thus, are listed to CSA standard B The eductors have been tested to B64 as required by B125 section 4-5, and thus, are acceptable backflow devices as defined by the CSA. For additional clarification on Hydro's adherence to CSA standards, see our link to CSA Standards. For a complete and up- to- date copy of Canadian plumbing standards, please contact the Canadian Standards Association.